NASA Lunar Orbiter 5 image of the plateau west-northwest of Marius crater on the Moon. Larger Image. 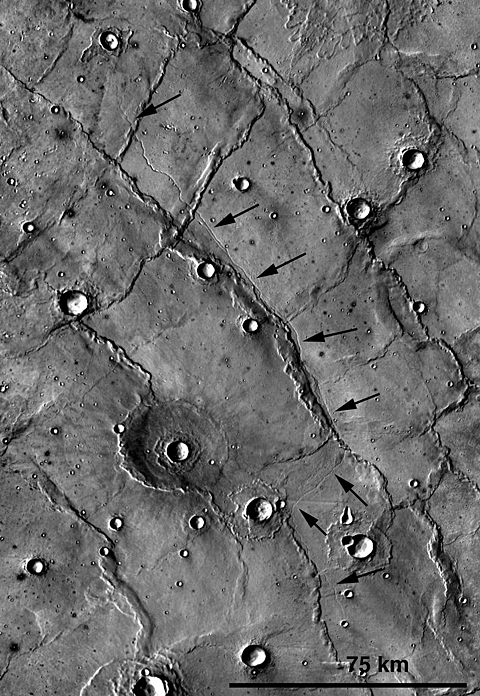 One of the supposedly best understood and least interesting landscapes on Mars is hiding something that could rewrite the planet’s history. Or not. In fact, about all that is certain is that decades of assumptions regarding the wide, flat Hesperia Planum are not holding up very well under renewed scrutiny with higher-resolution, more recent spacecraft data. “Most scientists don’t want to work on the flat things,” noted geologist Tracy Gregg of The University at Buffalo, State University of New York. So, after early Mars scientists decided Hesperia Planum looked like a lava-filled plain, no one really revisited the matter and the place was used to exemplify something rather important: The base of a major transitional period in the geologic time scale of Mars. The period is aptly called the Hesperian and it is thought to have run from 3.7 to 3.1 billion years ago. But when Gregg and her student Carolyn Roberts started looking at this classic Martian lava plain with modern data sets, they ran into trouble. So she turned her attention to what could be discerned on Hesperia Planum: about a dozen narrow, sinuous channels, called rilles, just a few hundred meters wide and up to hundreds of kilometers long. These rilles have no obvious sources or destinations and it is not at all clear they are volcanic. NASA/GSFC/Arizona State University Lunar Reconnaissance Orbiter image “Secrets of Schroeteri” Vallis Schroeteri is a sinuous rille on the moon; its inner rille diverges from the primary rille near arrow. Larger Image. THEMIS daytime infrared image mosaic (courtesy of ASU/NASA/JPL) of Mars with north is at the top. Image is centered at 116.3 deg E and 25.0 deg S Larger Image. “The question I have is what made the channels,”; said Gregg. Was it water, lava, or something else? “There are some lavas that can be really, really runny. And both are liquids that run downhill.” So either is a possibility. To begin to sort the matter out, Gregg and Roberts are now looking for help on the Moon. Their preliminary findings will be presented Wednesday, 12 Oct., at the meeting of The Geological Society of America in Minneapolis. 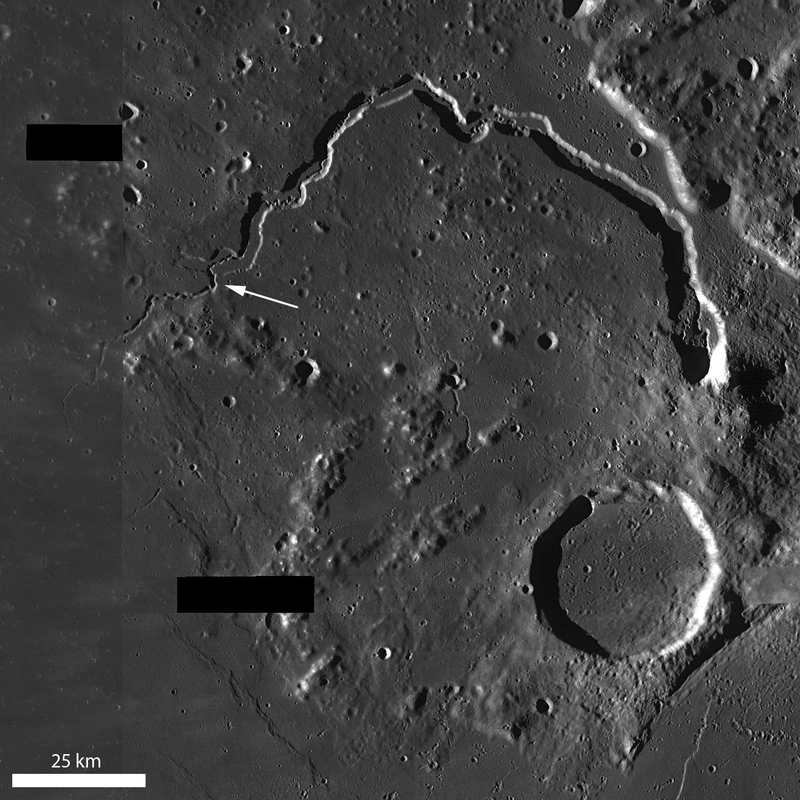 “On the Moon we see these same kinds of features and we know that water couldn’t have formed them there,” Gregg said. 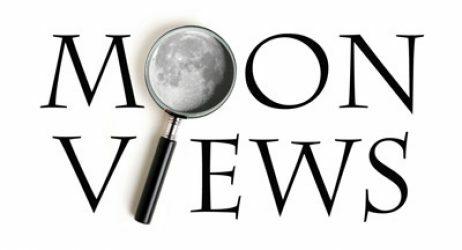 So they are in the process of comparing channels on the Moon and Mars, using similar data sets from different spacecraft, to see if that sheds any light on the matter. She hopes to find evidence that will rule out water or lava on Hesperia Planum. “Everybody assumed these were huge lava flows,” said Gregg. “But if it turns out to be a lake deposit, it’s a very different picture of what Mars was doing at that time.” It would also make Hesperia Planum a good place to look for life, because water plus volcanic heat and minerals is widely believed to be a winning combination for getting life started. She has found that other scientists are interested in her work because of its possible implications on the Mars geological time scale. Gregg is not worried that Mars history will need to be rewritten, but she does suspect that Hesperia Planum is a lot more complicated than people has long thought. Presentation Time: 3-3:15 PM, Wed., 12 Oct. 2011 Where: Minneapolis Convention Center, Room L100H-J What: 284-6: Sinuous Rilles in Hisperia Planum, Mars: Water, Lava, or Something Else? Keith’s note: Um, the ‘dark side’ of the Moon is constantly changing as the Moon spins on its axis – once a month. 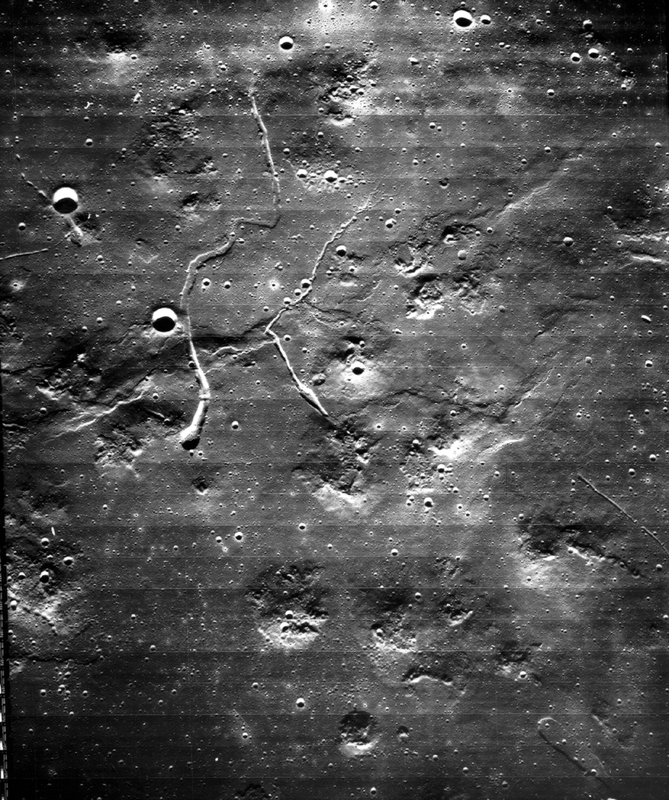 What Luna 3 photographed was the “far side” of the Moon. If the side of the Moon that was photographed by Luna 3 was indeed “dark” then there’d be nothing in the photo, right?